1Division of Cardiology, University of Arkansas for Medical Sciences, Little Rock, AR..2Department of Epidemiology, College of Public Health, University of Arkansas for Medical Sciences.3Division of Cardiology, Central Arkansas Veterans Healthcare System, Little Rock, AR..
New onset post-operative atrial fibrillation (POAF) can complicate both non-cardiac(NCS) and cardiac(CS) surgeries. Long term differences in recurrence of atrial fibrillation (AF) and incidence of ischemic stroke/transient ischemic attack(CVA)between these types of POAFare lacking. To compare thelong term recurrence rate of AF and incidence of CVAin patients withnew onset POAF after CS and NCS. All patients who developed POAF between May 2010 and April 2014 were included in this single-center, retrospective study Exclusion criteria included a prior history of atrial tachyarrhythmias and pre-operative use of anti-arrhythmic drugs. Recurrence of atrial fibrillation and CVA was identified by review of medical records, electrocardiogram and Holter monitor. patients identified by the ICD9 code=523, 112 patients (61 cardiac; 51 non-cardiac) met inclusion criteria. Mean follow up was 943 days (range 32-2052 days).AF recurrence rate within 30 days after hospital discharge was higher in CS compared with NCS(10% vs 0%, p =0.03). Kaplan Meier analysis showed a trend towards higher recurrence in NCS compared with CS(HR 2.8; 95% CI 0.78-10.6, log rank p =0.03).In long term follow-up, CVA was numerically more common in patients with POAF after CS compared withNCS(10% vs 2%) though this difference was non-significant(HR 3.1; 95% CI 0.72-13.3; log rank p =0.26). The risk of recurrent AF and ischemic stroke is not different between POAF after CS or NCS. The overall high rate of AF recurrence and risk of ischemic stroke mandate careful long term follow-up. Key Words : Post-Operative atrial fibrillation, Stroke, Cardiac Surgery, Non cardiac surgery, Recurrent Atrial Fibrillation. Post-operative atrial fibrillation (POAF) is often precipitated by adrenergic stimulation and local or systemic inflammation affecting a susceptible atrium in the peri-operative period. It affects approximately 30–60% of patients undergoing cardiac surgery(CS) and 5-10% undergoing non-cardiac surgery(NCS)[1,2].POAF is associated with increased intensive careunit and hospital length of stay, morbidity, mortality, hospital readmission, and long-term risk of stroke[3-6].Estimates of the average annual cost of treatment of POAF and its sequelae approach $1 billion in the United States alone. [7-9]While POAF after CS has been relatively well studied, the long term implications of POAF after NCS are less well understood. The long term risk of recurrent AF may be as high as 20-48% after CS while the long term risk of recurrence after NCS is unknown[10-14]. Prior studies relied on administrative databases and were limited in the length of follow-up. Since about 50 million NCS are performed each year in the United States alone , knowledge of long term implications of POAF after NCS is essential. In addition, differences in long term risk of POAF and cerebrovascular accidents between CS and NCS are unknown. A single-center, retrospective study was designed to include all patients (above 18 years of age) with POAF(confirmed by ECG or telemetry) between May 2010 to April 2014. Exclusion criteria included (1) Patients with a prior history of AF or atrial flutter, (2) use of anti-arrhythmic drugs pre-operatively (since the long half life of amiodaronecomplicates assessment of recurrent AF)(3) lack of confirmed AF post-operatively. Patients were identified using discharge ICD-9 code “427.31”(atrial fibrillation) among all patients who underwent a surgical procedure during this time period. Demographic data, patient characteristics and procedure information were recorded at the time of the indexed surgery/event from review of the electronic medical record. Primary endpoints of the study were recurrence of AF and ischemic stroke or transient ischemic attack(CVA).Recurrence of AF was identified by chart review and confirmed by ECG,Holter monitor or device interrogation(when available). Ischemic stroke was defined bythe presence of neurological symptoms and supported by radiographic diagnosis (MRI or CT scan) while transient ischemic attack (TIA) was defined by symptoms which resolved spontaneously within 24 hrs with no radiologic evidence of stroke. Follow-up ended on 1/1/2016 and duration of follow up was defined as the time between 30 days of hospital discharge (to distinguish between early and late recurrence)to either the last recorded clinical encounter or till a study endpoint was met. Local practice pattern for management of POAF during the study period was as follows: patients with a clearly defined onset of POAF received an attempt at rhythm control with a combination of intravenous and oral amiodarone(total loading dose of 2.5gms in 24 hrs) for a day followed by oral amiodarone(400mg a day) for atleast a month.If patients achieved sinus rhythm within 24-48 hrs. of onset, anticoagulation was not started (unless patient had another indication such as prosthetic valve). At discharge, 30 day follow-up was scheduled in the cardiac electrophysiology clinic where the drug was stopped if ECG documented sinus rhythm. 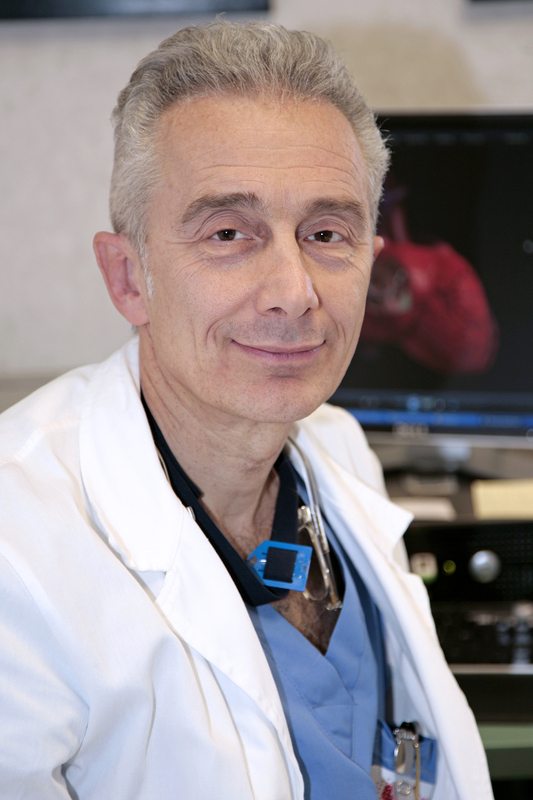 A Holter monitor was repeated at 6 months to rule out asymptomatic recurrences. Patients who received rate control strategy were followed up either in the cardiac electrophysiology clinic or primary care physician’s office.The study was approved by the institutional review board. Student t tests were used to compare continuous variables while Chi-square test was used for comparing categorical variables.Mann Whitney U test was used to compare medians. Differences in event rates (long term risk of recurrent AF and ischemic stroke) between CS and NCS were estimated using Kaplan-Meier analysis and log rank tests. All statistical analyses were performed with MedCalc (version 14, Ostend, Belgium).Statistical significance was defined by a 2-tailed p < 0.05. All authors had full access to the data and assume responsibility for the integrity of the data. All authors have read and agree to the manuscript as written. [Figure 1] delineates the search strategy. 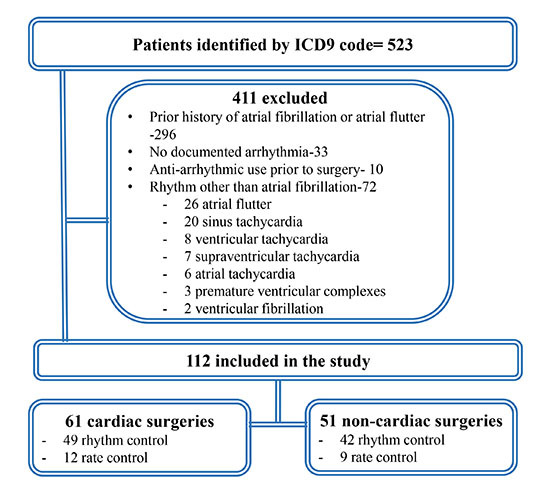 patients identified by ICD 9 code=523,59.6% had a prior history of AF while 13.8% had other arrhythmias that were wrongly coded and had no evidence of AF. The final cohort consisted of 112 patients;61 patients with POAF after CS and 51 after NCS. [Table 1]describes characteristics of the cohort.Patients who had POAF after CS had a significantly higher incidence of diabetes, hypertension and coronary artery disease. In the CS group, 27% underwent valve surgery while the rest were coronary artery bypass surgeries. The NCS group was comprised mostly of thoracic (39%) and abdominal surgeries(37%). Table 1. Clinical characteristics of patients in the cohort. POAF = post-operative atrial fibrillation; COPD= chronic obstructive pulmonary disease; ACEI- angiotensin converting enzyme inhibitor; CCB= calcium channel blocker. POAF occurred aroundthe 2nd to 3rd post-operative day (mean post-operative day of occurrence 2.4days CS vs.2.6 days NCS;p=0.29). Rhythm control(using a combination of intravenous and oral amiodarone)was the treatment strategy in 81% of the entire cohort (80% CS vs. 82% NCS, p= NS). Ibutilide and electrical cardioversion were used to achieve sinus rhythm in47% and 4% of patients respectively.Length of hospital stay was significantly longer in NCS compared with CS (13.6 ± 9.5 vs.10.1±5.9 days; p=0.007). In hospital mortality was 3.5% (5.8% NCS vs 1.6% CS, p =0.32). [Table 2] At hospital discharge, all patientswere in sinus rhythm. A majority of patients were discharged on a single antiplatelet agent (43% of the entire cohort-37% aspirin alone, 6% clopidogrel alone), 22% on aspirin and clopidogrel, 2% on warfarin alone, and 9% on combined warfarin and aspirin(all after valve surgery). At 30 day follow-up, AF recurrence was more common in CS group (10% vs 0%, p=0.03) and was no different in those treated with rate or rhythm control strategy (8.3% vs 10%; p = 0.9). [Table 2] Amongthose treated with rhythm control, mean duration of amiodarone therapy was 2.3 months (1.87 ±1.5 in CS VS 2.88± 2.89 in NCS, p= 0.004). Mean follow up duration was 943 days (range 32-2052 days).Median time to AF recurrence was 724 days(IQR 229-1157 days). AF recurred in 11 patients(12.5%; CS 9.4% vs NCS 17.1%).These patients were started on anticoagulation and there was no strokes within the study period. By Kaplan Meier analysis, there was a trend to significantly higher recurrence of AF after NCS compared with CS [Figure 2], HR 2.8; 95% CI 0.78-10.6, p =0.03) though the 95% confidence intervals crossedunity. Nine CVAs(including three TIAs) occurred during the follow-up periodat a median time of 901 days(IQR681-1093). Survival analysis by Kaplan Meier method showed no significant difference between CS and NCS (HR 3.1; 95% CI 0.72-13.3; p =0.26, [Figure 3]).Two patients were in atrial fibrillation at the time of the stroke(1 each in CS and NCS). Since paroxysmal AF can remain undetected at the time of the stroke, we reviewed data on all patients with CVA to the last available clinical date(after the end of the study-designated follow-up period) and found that 2	additional patients(both CS) were diagnosed with AF in clinical follow-up. Figure 2. Kaplan Meier analysis of difference in survival probability free of recurrent AF between POAF after cardiac and non-cardiac surgeries. Figure 3. 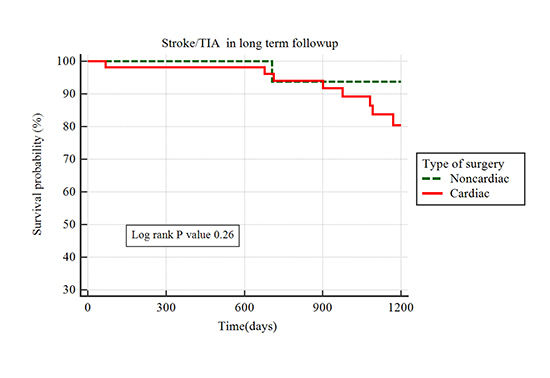 Kaplan Meier analysis of difference in survival probability free of ischemic stroke/TIA between POAF after cardiac and non-cardiac surgeries.TIA= Transient Ischemic Attack. In this study, we found a 15% AF recurrence rate in patients who develop POAF (with no prior history of AF) after both CS and NCS. Early recurrence(within 30 days of hospital discharge) was common after CS. Interestingly, among patients who were in sinus rhythm at 30 day follow-up, AF recurrence was numerically higher in NCS group though the confidence intervals crossed unity.This likely reflects larger arrhythmic substrate as well as local atrial injury in patients undergoing CS which predisposes them to early recurrence. On the other hand, POAF after NCS may reflect systemic factors at the time of surgery(and thus a lower short term recurrence rate between discharge and 30 day follow-up). The risk of CVAwas not statistically different. Among patients with stroke, 22% were in atrial fibrillation at the time of the stroke and another 22% were diagnosed with AF in follow-up after the CVA.Overall, three years after POAF,1 in 6 patients developed recurrent AFand 1 in 10 suffered a CVA.Thus, POAF should not be considered a benign post-operative complication and is an important predictor forrecurrent AF and related complications. Though the effect of POAF on immediate post-operative outcomes has been previously studied, its effect on long term outcomes remains largelyunknown. Most POAF converts to sinus rhythm with or without treatment and approximately 80% are in sinus rhythm at discharge,- . Long term follow-up of patients with POAF after CS suggests a 20-48% risk of recurrence(depending upon the duration of follow-up)-. In a single center study of 305 patients after CABG,POAF occurred in 88 (28.9%) patients. Post-discharge symptomatic AF occurred in 25 (8.2%) patients with an annual incidence of 2% during a mean follow-up of 48 + 30 months and recurrence was more common in those withPOAF compared with those without POAF(20.4% vs 3.2%, p<0.0003)  . Similarly in another single center experience, recurrent AF after POAF was 18.9% after a mean follow-up duration of 41+ 23 months . In a community based study from Olmsted County with the longest available follow-up(8.3+ 2.3 years), the rate of AF was as high as 42.6%  . In all these studies, POAF was a significant predictor of future AF. The recurrence rate of AF likely depends on the follow-up strategy employed. Many clinicians follow patients clinically and with periodic electrocardiograms and Holter monitoring as was performed in the current study. An intriguing approach would be the implantation of loop recorders for long term follow-up. In a recent nonrandomized study using this approach, the recurrence rate after CS was as high as 61%. To our knowledge, there are no long term follow-up studies after POAF complicating NCS with the longest available follow-up of 1 year(in an administrative database)  . Data on the risk of long term ischemic stroke after POAF is even more limited. In the study by Gialdini et al, 1 year incidence of CVA was 1.47% in patients with POAF after NCS compared to 0.36% in patients who did not develop POAF  . POAF was associated with subsequent stroke both after CS (hazard ratio, 1.3; 95% CI, 1.1-1.6) and NCS (hazard ratio, 2.0; 95% CI, 1.7-2.3) and interestingly, the association was stronger for POAF after NCS (P < .001 for interaction). Despite the large number of patients studied, the lack of detailed medical history and relatively short term duration of follow-up were limiting factors to this analysis. The current study provides the most comprehensive data (albeit in a small sample) on the risk of recurrent AF and incidence of ischemic stroke in long term follow-up after NCS. In contrast to the study by Gialdini et al, we found no significant difference in risk of stroke after CS and NCS. Mean CHA2DS2-VASc scores were similar in these groups at baseline and in more than half the cases, CVA occurred in the absence ofrecurrent AF. This suggests that in addition to AF, other vascular risk factors may play a role in causing ischemic stroke in long term follow-up. Despite the smallsize of the cohort, this study has several strengths. This is the first study to provide long term follow-up of patients who achieved sinus rhythm after POAF complicating NCS. We systematically eliminated all patients who had a history of AF or were on anti-arrhythmic therapy prior to surgery. The search strategy employed, excluded close to 14% of patients who were miscoded as AF. This emphasizes the limitation of using large administrative databases in studying POAF where individual medical records and ECG recordings are unavailable for review. The current study also provides insight into the optimal management of POAF. Similar to a recent large randomized study in patients after CS  , there was no significant difference in early recurrence between those treated with rhythm control vs rate control after NCS. There are several limitations of the study. The management and anticoagulation strategy in thissmall cohort reflects practice patterns in a single center. The small number of patients and the large number of baseline differences between patients undergoing CS and NCS precluded propensity matching. Follow-up was limited to those who survived index hospitalization; was based on chart and ECG review and there was no continuous rhythm monitoring. The event rate may be higher than found in this study since small, clinically silent strokes and asymptomatic paroxysmal AF may have remained undiagnosed during the study period. The absence of a control group without POAF prevents the assessment of the relative risk of developing recurrent AF and CVA. Despite achieving sinus rhythm, there is a significant risk of long term recurrence of AF and CVA among patients with new onset POAF. The risk of recurrent AF is similar between CS and NCS. These preliminary results should be verified prospectively in a larger, multi-center cohort.In addition, the optimal anticoagulation strategy at hospital discharge and clinical follow-up in this population remain to be determined. Mariscalco Giovanni, KlersyCatherine, ZanobiniMarco, BanachMaciej, FerrareseSandro, BorsaniPaolo, CantoreCristiano, BiglioliPaolo, SalaAndrea. Atrial fibrillation after isolated coronary surgery affects late survival. Circulation. 2008;118 (16):1612–8. Mathew Joseph P, FontesManuel L, TudorIulia C, RamsayJames, DukePeter, MazerC David, BarashPaul G, HsuPing H, ManganoDennis T. A multicenter risk index for atrial fibrillation after cardiac surgery. JAMA. 2004;291 (14):1720–9. Filardo Giovanni, AdamsJohn. Postoperative atrial fibrillation and late mortality after valvular surgery. Ann. Thorac. Surg. 2010;89 (6):2073; author reply 2073–4. Attaran Saina, ShawMatthew, BondLaura, PullanMark D, FabriBrian M. Atrial fibrillation postcardiac surgery: a common but a morbid complication. Interact Cardiovasc Thorac Surg. 2011;12 (5):772–7. Filardo Giovanni, HamiltonCody, HammanBaron, HebelerRobert F, AdamsJohn, GrayburnPaul. New-onset postoperative atrial fibrillation and long-term survival after aortic valve replacement surgery. Ann. Thorac. Surg. 2010;90 (2):474–9. 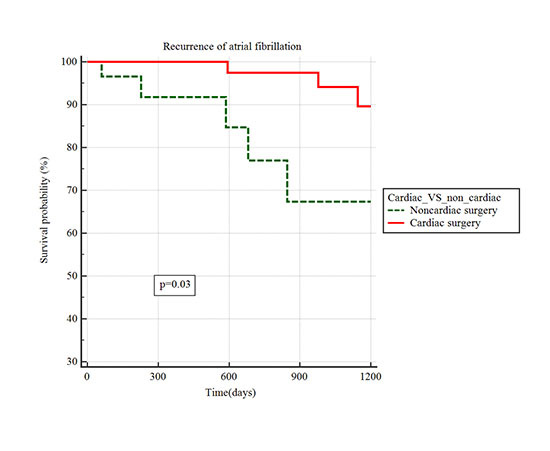 Philip Femi, BeckerMatthew, GallaJohn, BlackstoneEugene, KapadiaSamir R. Transient post-operative atrial fibrillation predicts short and long term adverse events following CABG. Cardiovasc Diagn Ther. 2014;4 (5):365–72. Echahidi Najmeddine, PibarotPhilippe, O'HaraGilles, MathieuPatrick. Mechanisms, prevention, and treatment of atrial fibrillation after cardiac surgery. J. Am. Coll. Cardiol. 2008;51 (8):793–801. Aranki S F, ShawD P, AdamsD H, RizzoR J, CouperG S, VanderVlietM, CollinsJ J, CohnL H, BurstinH R. Predictors of atrial fibrillation after coronary artery surgery. Current trends and impact on hospital resources. Circulation. 1996;94 (3):390–7. Mozaffarian Dariush, BenjaminEmelia J, GoAlan S, ArnettDonna K, BlahaMichael J, CushmanMary, DasSandeep R, de FerrantiSarah, DesprésJean-Pierre, FullertonHeather J, HowardVirginia J, HuffmanMark D, IsasiCarmen R, JiménezMonik C, JuddSuzanne E, KisselaBrett M, LichtmanJudith H, LisabethLynda D, LiuSimin, MackeyRachel H, MagidDavid J, McGuireDarren K, MohlerEmile R, MoyClaudia S, MuntnerPaul, MussolinoMichael E, NasirKhurram, NeumarRobert W, NicholGraham, PalaniappanLatha, PandeyDilip K, ReevesMathew J, RodriguezCarlos J, RosamondWayne, SorliePaul D, SteinJoel, TowfighiAmytis, TuranTanya N, ViraniSalim S, WooDaniel, YehRobert W, TurnerMelanie B. Heart Disease and Stroke Statistics-2016 Update: A Report From the American Heart Association. Circulation. 2016;133 (4):e38–360. Antonelli Dante, PeresDimitri, FreedbergNahum Adam, FeldmanAlexander, RosenfeldTiberio. Incidence of postdischarge symptomatic paroxysmal atrial fibrillation in patients who underwent coronary artery bypass graft: long-term follow-up. Pacing Clin Electrophysiol. 2004;27 (3):365–7. Lee Seung-Hyun, KangDae Ryong, UhmJae-Sun, ShimJaemin, SungJung-Hoon, KimJong-Youn, PakHui-Nam, LeeMoon-Hyoung, JoungBoyoung. New-onset atrial fibrillation predicts long-term newly developed atrial fibrillation after coronary artery bypass graft. Am. Heart J. 2014;167 (4):593–600.e1. Melduni Rowlens M, SchaffHartzell V, BaileyKent R, ChaStephen S, AmmashNaser M, SewardJames B, GershBernard J. Implications of new-onset atrial fibrillation after cardiac surgery on long-term prognosis: a community-based study. Am. Heart J. 2015;170 (4):659–68. Bhave Prashant D, GoldmanL Elizabeth, VittinghoffEric, MaselliJudith, AuerbachAndrew. Incidence, predictors, and outcomes associated with postoperative atrial fibrillation after major noncardiac surgery. Am. Heart J. 2012;164 (6):918–24. Gialdini Gino, NearingKatherine, BhavePrashant D, BonuccelliUbaldo, IadecolaCostantino, HealeyJeff S, KamelHooman. Perioperative atrial fibrillation and the long-term risk of ischemic stroke. JAMA. 2014;312 (6):616–22. El-Chami Mikhael F, MerchantFaisal M, SmithPaige, LevyMathew, NelmsAngela Gill, MerlinoJohn, PuskasJohn, LeonAngel R. Management of New-Onset Postoperative Atrial Fibrillation Utilizing Insertable Cardiac Monitor Technology to Observe Recurrence of AF (MONITOR-AF). Pacing Clin Electrophysiol. 2016;39 (10):1083–1089. Gillinov A Marc, BagiellaEmilia, MoskowitzAlan J, RaitenJesse M, GrohMark A, BowdishMichael E, AilawadiGorav, KirkwoodKatherine A, PerraultLouis P, ParidesMichael K, SmithRobert L, KernJohn A, DussaultGladys, HackmannAmy E, JeffriesNeal O, MillerMarissa A, Taddei-PetersWendy C, RoseEric A, WeiselRichard D, WilliamsDeborah L, MangusanRalph F, ArgenzianoMichael, MoqueteEllen G, O'SullivanKaren L, PellerinMichel, ShahKinjal J, GammieJames S, MayerMary Lou, VoisinePierre, GelijnsAnnetine C, O'GaraPatrick T, MackMichael J. Rate Control versus Rhythm Control for Atrial Fibrillation after Cardiac Surgery. N. Engl. J. Med. 2016;374 (20):1911–21.